As we get to the point in the post-secondary year when the burning desire for knowledge starts to fade, it’s time to refuel with optimism and a clear vision of the future. 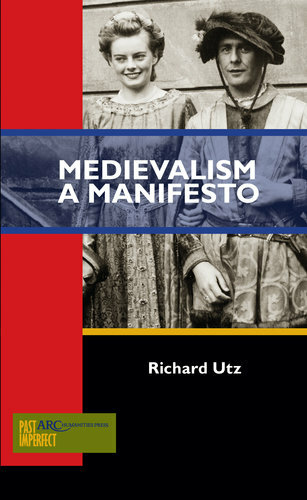 Enter Richard Utz’s Medievalism: A Manifesto, the result of years of careful thought about the place of Medieval Studies within the world at large. The book is a carefully-constructed rallying cry for medievalists to descend the ivory tower and throw open its doors, welcoming the public at large by purposefully seeking out ways to engage it. Utz sets out his argument by using specialist terminology, footnotes, and a thorough range of examples to explore the former and the current boundaries of Medieval Studies in a careful attempt to convince the most skeptical of his target audience: the distanced and detached scholar who longs for empirical evidence above all things. At the same time, he models the approach for which he is so passionately advocating by embracing the personal, affective side of his argument, even going so far as to refer to song lyrics, and to use a picture of his own parents in medieval costume as the cover photo. Utz thereby demonstrates that investigating scholars’ love for the Middle Ages alongside their work can strengthen it, rather than detract from it, and that no historical scholarship happens in a vacuum. For Utz, making medieval scholarship publicly accessible is not just a handy option to diversify a résumé, but a responsibility. As he says, “These protective ivory tower walls have resulted in a situation where too many have conveniently forgotten to repay the high privilege by actively connecting our scholarship” (86). Utz knows that he is calling for a full-scale revolution in Medieval Studies, and it’s true. Removing the stigma from writing for the larger public – and learning to value it alongside traditional forms of academic writing – will be a bumpy process and require a fundamental shift in scholarly thinking. It will also require retraining many established scholars to learn a whole new writing style, and teaching new scholars to embrace outreach as they find their footing in academia. But evolution is the key to survival, and, as Utz points out with myriad examples (Medievalists.net among them), Medieval Studies already has a foothold on new forms of communication. It’s probably no surprise to anyone that I’m on the same wavelength as Utz in terms of the premise of the book, but Medievalism: A Manifesto is well-argued, inspiring, and also timely, as its immediately sold-out first print run indicates. This book is for the scholars who need to shed their guilt over “cheating” on their scholarship by indulging in fun medievalism; it’s for the grad students who need to be reminded of what inspired them to first set foot in our field; it’s for the department chairs who are wondering how to make their departments “more relevant”. In other words, Medievalism: A Manifesto is a must-read for anyone in our field, and a rallying cry for scholars in general to harness the power of public platforms to better society. If you need a quick read to relight your fire, this is it.